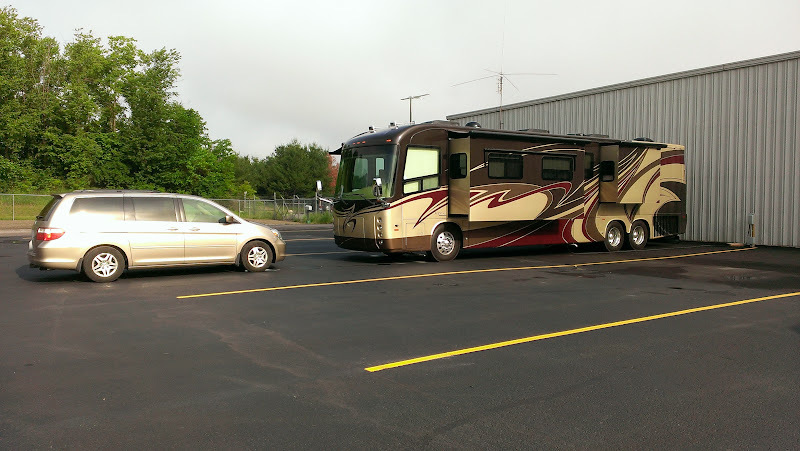 …our brand new coach was parked in Indiana! It didn’t take Entegra quite that much time to do the repairs, but as you may know things here at home prohibited us from making the trip to pick her up any sooner. 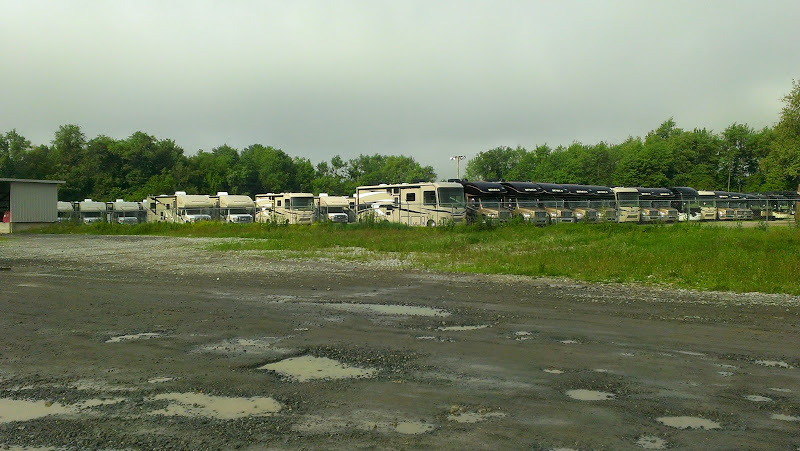 When we arrived at Entegra the drizzly Monday morning of June 10, there she was sitting in the newly expanded overnight lot (Entegra had just finished increasing the number of sites at the service center from 6 to 10) looking all pretty and waiting patiently for our arrival! Finally! We were so excited it was like buying her all over again! After we took a quick peek at her, we headed inside to tell PJ we had arrived. The plan was that he would go through each of the punch list items with us. Along the way, we stopped to introduce ourselves to Chuck Lasley, Regional Sales Manager. He was interested in feedback about our Albany RV experience . After chatting with him for a bit, we then stopped to introduce ourselves to Ted Cook who is one of the engineers. We had heard that he was the one who actually found the kink in the PEX tubing under the tile floor. He showed us a video he had taken in search of the kink and explained that this was only the 2nd coach (out of almost 1000) that had had this type of problem (lucky us). PEX (Cross Linked Polyethylene) is a very tough but somewhat bendable plastic pipe that has properties that make it well suited for plumbing and heating applications. You will find it in most new homes being built today as a replacement for hot and cold copper water supply lines as well as most in-floor heating installations. On our coach, in addition to 6 hydronic heat exchangers (radiators) available for rapid heating, the tile floors are also directly heated by a long loop of PEX (I’m guessing over 100 feet worth). 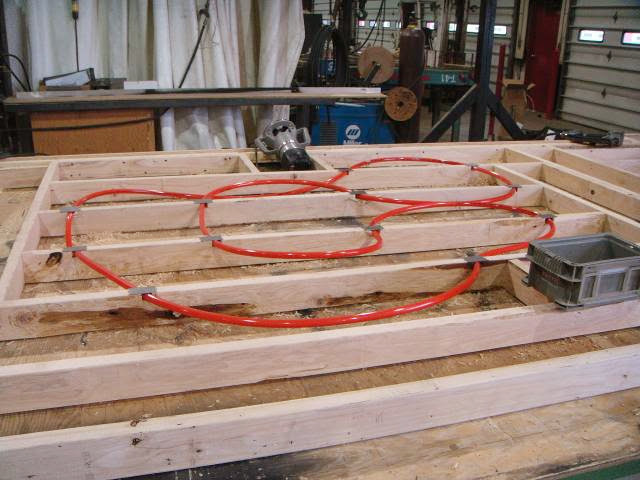 The PEX loops around under the subfloor and is held in place by plastic clamps. Well, one loop, for some unknown reason, ended up with a radius that was a tad too small and the clamps on either end were a bit too tight – when the hot water expanded the pipe slightly it kinked. Needless to say, engineering has taken steps to make sure this potential problem is avoided on coaches in production. Anyway, we finally made our way over to find PJ and we proceeded out to our newly updated coach where he spent almost two hours with us while we inspected each punch list item. Everything looked great! Yippee! Once we were done with the inspection, we left Entegra and headed over to Rise N Roll to grab a bite to eat. By now it was after 3 pm and they had stopped serving lunch. But luckily, they still had the sandwich ingredients out so they were willing to make us a yummy sandwich which we split. Since the soup we had last time was so excellent we asked if they still served soup – nope, they only have soup until April. We aren’t big doughnut fans but this time we were unable to resist the unique and scrumptious Cinnamon Caramel doughnuts – not only did we buy 1/2 dozen fresh, but we also bought a full dozen frozen for future consumption. There are free samples of the doughnuts (and many other items) so if you ever happen by, give them a try! 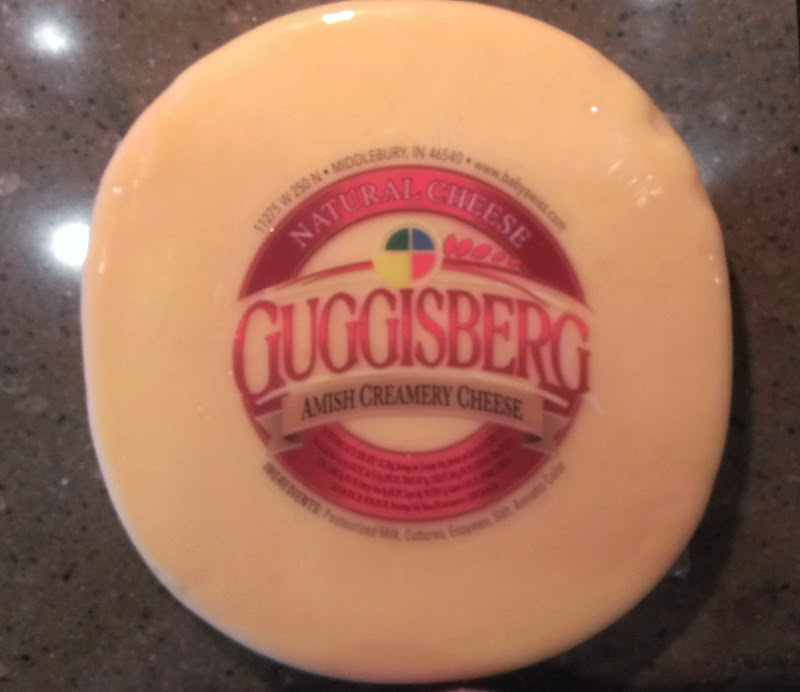 Also, because we had no food on board, we ended up buying one of their rectangular shaped frozen specialty pizzas (BTW it was very yummy) and another pound of Guggisberg Creamery Cheese, our favorite. 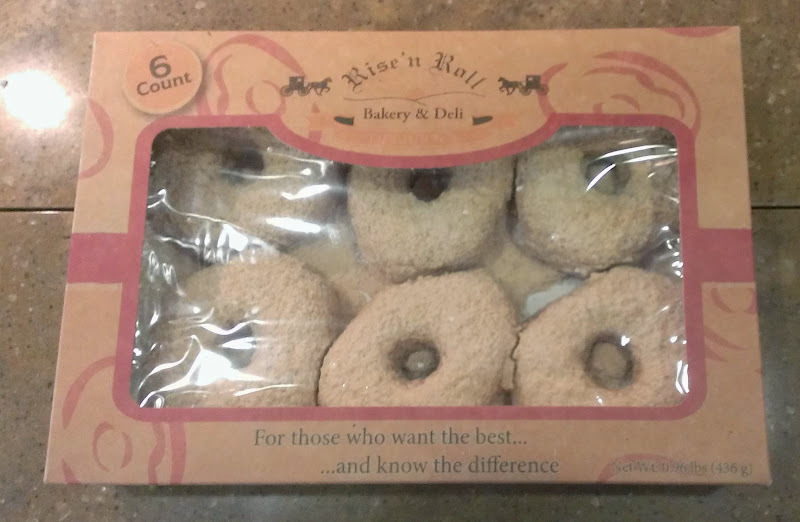 It is interesting to note that the Rise N Roll also produces Gluten Free items. 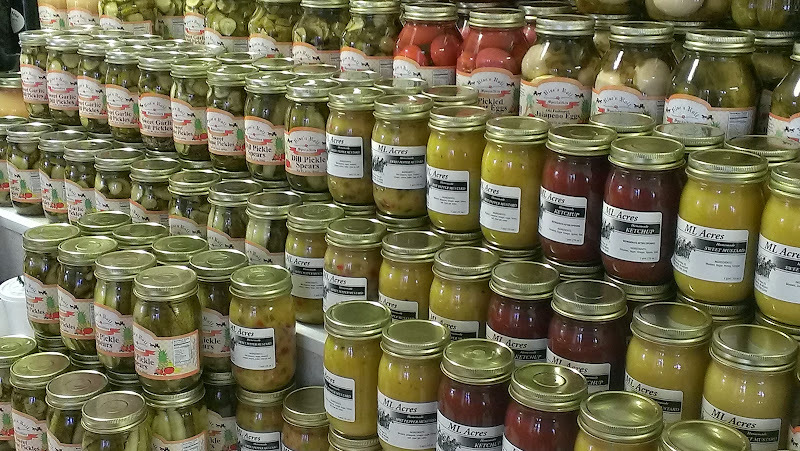 There are so many yummy looking jars of fruits, veggies, and pastry items I probably could have spent a lot more money but managed to exercise some restraint (well I guess more like Rob got the exercise restraining me and dragging me out the door). After returning to our coach, we spent the night checking everything out, making sure all systems were humming perfectly. Good news – they were! The next morning we went to the weekly (every Tuesday) customer breakfast followed by a customer Q & A session, this time led by Don Brubaker, Director of Customer Service. Three other couples attended as well. 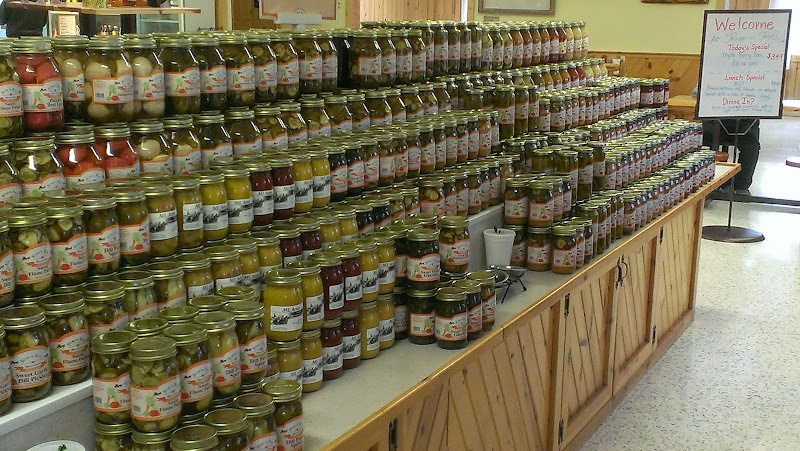 Believe it or not, we decided to go on our third factory tour led by Don. We’re not bored with the tour yet – each time we learn or see something new. A lot of excitement is brewing in the factory as the 30,000 square foot expansion of the Class A production line is just about complete. Entegra will be able to create more jobs and almost double their production to up to 20 coaches per week (up from as many as 10) allowing them to keep up with the increasing demand. Also the new entry level Jayco Precept gas coach is being built in the same building but on a different production line. Following the tour, we were talking to another couple – Dan and Charolette who mentioned they were paying over $4000 for insurance. Rob suggested that they call the broker that we used, PoliSeek, since we are only paying about $1100 for very good coverage. When we bought our Fleetwood, PoliSeek did a comparative analysis and we determined that Blue Sky was one of our better options (policy includes full replacement value and full-timer coverage). We fully expected our premium for the new Entegra would be substantially more than the Discovery, but surprisingly it only increased by about 10%. A day or two later we received an email from Dan exclaiming how happy they were that they talked to us – they had saved $1700 on their insurance! BTW, if this info helps and you do call PoliSeek, be sure mention us as they offer referral bonuses. 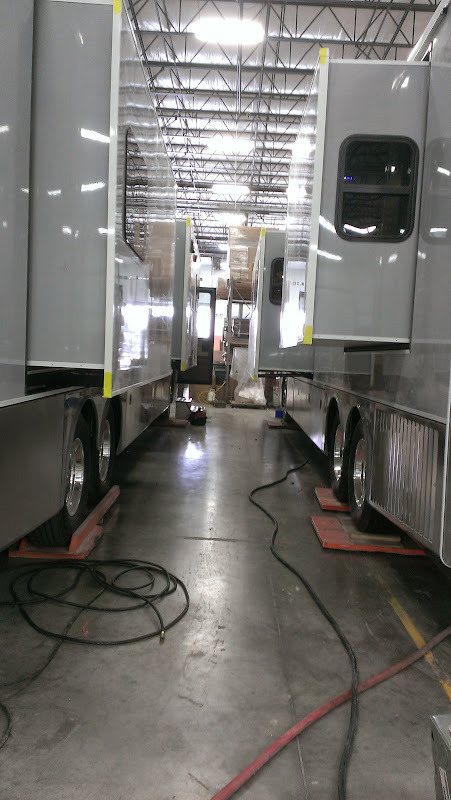 Finally it was time for us to say goodbye to everyone and head for nearby Spartan Chassis in Charlotte, MI where we had an appointment on Wednesday for a 44 point chassis inspection.